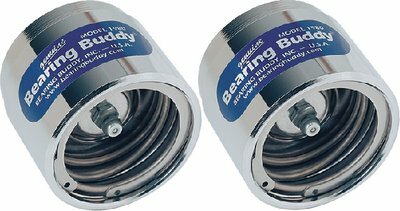 Bearing Buddy replaces the dust cap in the axle hub. The hub is filled with grease via a fitting in the piston of the Bearing Buddy. This spring loaded piston then holds a slight, constant pressure inside the hub. When wheels are submerged, this higher pressure, together with the hub being full of grease, keeps out water. The piston rides on an O-ring seal. Any attempt to overfill the hub forces the piston out beyond the O-ring, and excess grease escapes around the edge of the piston. This automatic pressure control feature limits pressure in the hub to 3 psi to protect the rear seals from rupture. Since the hub is full of grease, the bearings are constantly lubricated and the rear seals last longer as they ride on a lubricated surface. To convert a model number to the hub bore in inches (or dust cap diameter), simply place a decimal point after the first digit in the model number (1.980 for example). If you have any questions about this product by Bearing Buddy, contact us by completing and submitting the form below. If you are looking for a specif part number, please include it with your message.